I was very fortunate to have been assigned to the 281st Assault Helicopter Company that was based in Nha Trang. It not only exposed me to the reality of war but let me learn about life first hand with no one to whitewash it over for me. I went there a man/child and came out a man. Standards in my life were set and outlooks were established. Most of all I learned about people and what really counts in this short life of ours. Little things just don't bother me very much anymore even though I see person after person putting a dollar's worth of effort into a nickel project. What a waste of effort. The people made the unit, just as with every other unit in Vietnam. Our mission was slightly different and I certainly benefited from it. These stories are a result of all that. In general the 281st supported the Green Beret (Special Forces as we called them). It was their job to go into an area, usually before a big push, and gather/verify intelligence. It was our job to get them in and out which meant being in the field (tents) for a month at a time. When the month was up we traded places with the other platoon and went back to Nha Trang for regular missions. Those regular missions included combat assaults with the ARVN (Army Republic Vietnam), Koreans and sometimes American troops. We also did ash & trash runs which were a hodgepodge of every conceivable mission known. It all made for a very diversified training and it allowed most of us to go all over the country and experience things that most pilots didn't have the chance to. I soon learned the true meaning of the 3 Musketeers motto, "All for one and one for all". That was why the 281st work as well as it did. If everybody did their job then chances were good that we would all make it home at night. We all depended on one another. One of the very first things that I learned was that you sure can't judge a person by his looks. The guys in the photo to the left are all pilots (I'm the real skinny one in the middle with the hat). They sure don't look like the Air Force types you see on TV but that's the beauty about life, you don't have to look good to be good. There wasn't a one that I wouldn't trust with my life. I would like to say right here that not once did I see drugs used or war crimes committed, not with the 281st or the 192nd. There was a lot of drinking at the end of the day and some pretty tall stories and versions of the day's activities but no drugs that I saw. As for racial problems, I didn't see any. Bullets and helicopters don't know color. Life in Nha Trang was very good compared to many of the other units. I had a single room and the SF Officers club had some fine food and floor shows. We didn't get mortared that often and we were allowed to go downtown in the evenings, after all the flying was done. My bottom level rank didn't warrant any additional duties so I guess I had it kind of easy. 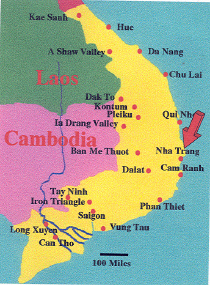 In my second month some of the guys took me to the red light district of Nha Trang. We peeked in some of the houses of ill repute though we didn't buy. We did some bar hopping and ended up in the To Duo bar I believe. There I saw a dark skinned young lady, of about 18 I would say, whose bar name was "Tiger Lilly". She was beautiful. I bought her several "Saigon Teas" and we talked and talked. When we had to leave to get back to camp I couldn't wait to get back. Getting back took about two months and when I saw her again she was now in her mid 20's. About four months after that I saw her again and she was now behind the bar passing the drinks to the younger newer girls. Tiger Lilly was now in her 40's. It was hard for me to believe that someone could age that quickly. I attribute it to a steady diet of just fish and rice with very few vegetables. I was told the average Vietnamese made about $3 a month. Bar girls made drink money and $10 a night if they took somebody home which had to be almost every night. I hope she saved her money. Working the "Delta" missions with the SF teams was really a learning experience. The teams would be given a specific area to work and we would have to put them in as close as possible to where they wanted in. We also had to be ready to pull them out on really short notice if they were compromised and had to run for it. There were 2 teams and both stayed out for several days. Teams were usually inserted just before dusk so that they would have the cover of night to depart the immediate area. It also allowed us enough time to pull them out really quick if need be. Both the SF we worked with and their Vietnamese rangers were top notch and their professionalism gave us a great track record. My first insertion put it all in perspective for me as to just what we were doing and who's job was what. The teams had to be put into a specific area as close as possible to a certain location on their map. The AC would scout out the area a day or two before hand as part of a small flight of choppers. C&C (Command & Control) was lead with "rescue 1" and "rescue 2" behind him. In back of them were the insertion ship/ships. The gun ships came along at their own pace. When a team went in it was the AC's (Aircraft Commander) ball game. The PP (Peter Pilot) was there to learn and try to get the ship back to base if the AC took a hit. On short final to the landing point the door gunners had their guns at the ready to spray the tree line which would keep Charlie's heads and guns down if the insertion went sour. The gun ships would position themselves to take out the tree line if need be. They were monitoring our frequency and literally a second away from trigger pull. Usually the team was out in seconds and we were out of there just as fast. If we took hits they took it personal, we liked it that way. If things went wrong it was the job of rescue 1 and 2 to go in and pick up the team and crew. On occasion we had to pull a team out that was on the run. If they could not make it to a spot big enough for the ship we had them pop smoke and pulled them out via the electric hoist. That meant only three at a time and if Charlie was on their tail the last ones had to be quick. 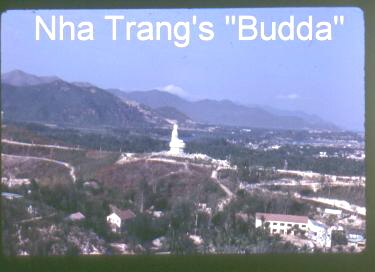 It was always a pleasure to see the big Buddha of Nha Trang after a long day or when we returned from a Delta. It meant that we were home and all was safe, at least from our point of view. It meant being with friends, good food, and a hot shower. The 281st was a true learning experience. As I mentioned earlier you sure couldn't line everybody up and pick out the ones that you thought would be good. More than likely it was the short, premature bald guy with the baby fat that was your best choice. Really though, personalities aside, anyone of them could do the job. Though Nha Trang had a really nice beach I didn't get to see it very much except from the air. Getting there during the day was virtually impossible for us slick pilots, not for the gun ship pilots though. The slicks were piled up with all kinds of ash & trash missions but there was really nothing the gun ship pilots could do except wait and rest up. We didn't mind though because we considered that sort of their reward for the coverage they gave us when things got hot and the bullets started to fly. I can't say enough about the coverage you knew you had and got from the "guns" when the bullets started to fly. Many a time I heard the shrapnel from one of their rockets ping against the side of our ship because it went off in the tree line that was that close to us. That pinging from their close in rockets meant no bullets coming in through the windows or taking out one of us. I did manage to get an entire day off once. I had just over six months in country and was suppose to hitch an early morning ride up north with one of the big Chinook helicopters. They packed the Chinook with boxes of rotor blades, because we were going through so many, and there was just no room for me. One of the gunnies who was there making sure their blades got on told me they were going to the beach later and asked if I wanted to come along since I had got bumped from the Chinook flight. Didn't take me but a few seconds to figure things out. If I went back to Ops and told them I got bumped from the flight they would just find me something to do there and no beach. But if I didn't say a thing until I got back from the beach there would be little they could do. And so I finally had my first full day at the beach and did I ever put it to good use. The little lady to the right, that's "Miss Carol" one of the girls that worked the cash registers at the PX. Not all Vietnamesse worked in the rice paddys. I hope you enjoy these stories. They are meant to give you a first hand account of what things were like for chopper pilots over there. They are meant for the children and grandchildren of the many warriors that fought in that war. Though these stories are of my accounts they parallel over and over again the stories of virtually all chopper pilots in Vietnam. Sit a chopper pilot down, get him talking and you will see the similarity. I'm just one of the ones that is taking the time to write about it now. Enjoy the site!